Space Safety » Archive » Engineering » Nuclear Propulsion » Will Anyone Recover Apollo 13’s Plutonium? 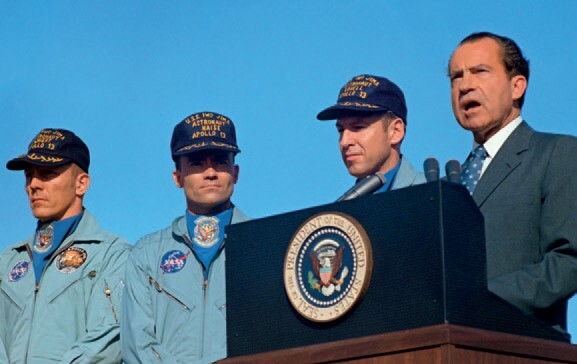 President Nixon (right) presenting the nation’s highest civilian award to the Apollo 13 crew (left to right, J. L. Swigert, F. W. Haise, J. A. Lovell) (Credits: NASA). Somewhere among the jagged trenches of the South Pacific sits a graphite fuel cask containing 3.9 kg of plutonium from Apollo 13. The fate of the radioactive plutonium-238 has long been overshadowed by the successful return of the three NASA astronauts on board the ill-fated mission. The plutonium was supposed to fuel the System for Nuclear Auxiliary Power, or SNAP-27 Radioisotope Thermoelectric Generator (RTG), designed to power a set of experiments on the lunar surface. But after an explosion crippled the craft and forced the crew to abandon plans of a lunar landing, the plutonium became yet another problem for mission control. Officials from NASA confidently told The New York Times that the biggest risk was that the 40-pound generator might hit someone when it fell to Earth. “It will keep a few fish warm,” a NASA official said. The Atomic Energy Commission, on the other hand, conceded the slight possibility that it could become ground into dust and dispersed. NASA learned its lessons about engineering the fuel casks the hard way: in 1964, the Transit-5-BN mission aborted and the RTG burned up upon reentry above Madagascar, in keeping with its design. Traces of plutonium were found in the area months later. In 1968, the Nimbus B-1 weather satellite was aborted soon after takeoff from Vandenberg Air Force Base and the plutonium from the SNAP-19B2 RTG plunged into 300 feet of water off the California coast, with no release of radiation. Apollo 13’s SNAP-27 fuel, as far as we know, slipped beneath the waves and came to rest 6 to 9 kilometers deep in the Tonga Trench, one of the deepest areas in the ocean. Subsequent testing by the U.S. Department of Energy has shown no spike in background radiation. Not surprisingly, NASA has no desire to go looking for the small cask, even with advances in submersible technology that would make such a mission at least technically feasible. “I don’t think that anyone has seriously considered that because of the cost of recovery,” said Leonard Dudzinski, a NASA program executive who deals with radioisotope power systems. 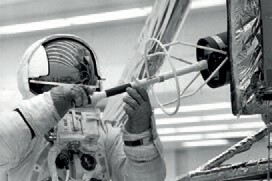 Fred Haise extracts the fuel element for the SNAP-26 RTG during training (Credits: NASA). Indeed, NASA is trying to source additional plutonium 238 for its future deep space missions – the U.S. no longer produces the isotope and Russia has proved to be an unreliable source – but the useful life of the Apollo 13’s plutonium has expired. The plutonium poses little danger to the environment: the corrosion resistant cladding should withstand seawater for approximately 870 years, ten times the plutonium’s half life. According to NASA, the plutonium itself was in oxide form and was both chemically and biologically inert when it plunged into the ocean. Critics have taken different lessons from the untimely plunges of the RTGs. In 1997, a group of safety experts, including physicist Dr. Michio Kaku, warned that 32 kg of plutonium contained in the Saturn-bound Cassini satellite posed a greater danger than NASA would acknowledge, but ultimately, their warnings did not prevented the mission from happening. Matthew Van Dusen is a New York-based journalist. He is the Editor of Txchnologist.com, a publication sponsored by General Electric. This article was first published in Space Safety Magazine Issue 2, Winter 2012. I really think RTG are cool, but they scare me because they keep getting lost, and often end up in scrap yards. Thankfully the Apollo 13 unit is safely at the bottom of the ocean. I think it would be very wise for NASA to reconsider its stance on recovering this discarded 3.9 kg (8.59 lbs) of Pu-238 from the failed Apollo 13 mission of April, 1970. My reasons are 1) The value of this plutonium is extreme. Back in 2009, Russia was to sell the U.S. 36 pounds at a cost of $720,000/pound or a grand total of $25.92 million. 2) Could these highly radioactive material be readily located using 21st century technology possible miles down in some South Pacific trench? 3) It would be very interesting to see what state this material is in after 47 years undersea; meaning did its cladding hold up well? 4) We are currently in a RTG state of emergency! No one is producing this material anymore and it will bring any space venture past 2020 to a grinding halt!